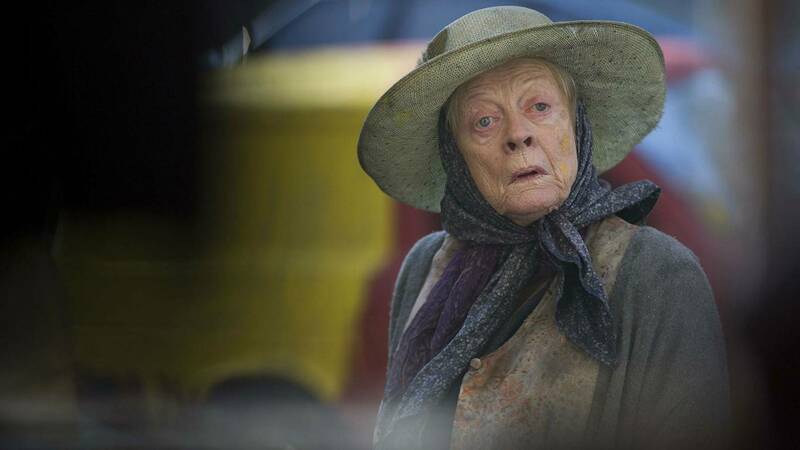 I’ll admit, when I first saw the trailers for “The Lady in the Van,” in which it appeared Maggie Smith was playing the Dowager Countess as a homeless woman, I cringed mightily. From the sound of its premise – a British playwright lets a homeless woman park her van in his driveway for years, making it sound like a saccharine buddy comedy – to the inescapable fact that Smith (for now, at least) is so intrinsically tied to Violet Grantham, “Lady” just sounded extremely unappealing. Fortunately, Smith’s acidity cuts through the sugar, and “Lady” turns out to be a sentimental but entertaining film – not great art, surely, but sardonic and empathetic in pretty much the right doses. Alex Jennings (Prince Charles in 2006’s “The Queen”) plays Alan Bennett, the British playwright (“The History Boys”) who converted this real-life experience into a book in 1989, a play in 1999, a radio play in 2009 and, finally, this film. Bennett befriended the eccentric Miss Shepherd in the 1970s, reluctantly but politely inviting her to move her ramshackle van off the street and into his driveway. He thought it would be a temporary solution to allow her to find a more permanent home, but she ended up parked there for 15 years. Smith imbues Miss Shepherd with dignity that defies her circumstances – a prickly and impossible woman, to be sure, but a fully dimensional human being who is more than a vehicle for Bennett’s voyage of self-discovery. Bennett almost reluctantly pieces together Miss Shepherd’s tragic past while also dealing with his own issues – accepting his sexuality and watching the sad decline of his own mother (Gwen Taylor). Fortunately, the intelligent script presents us with two Bennetts – one, the writer side, who’s always looking for material; the other, the introverted, mostly closeted man who hesitates to reduce a suffering woman solely to what she brought to his life, rather than recognizing her own agency. Because we’re constantly made aware of the tricky balancing act, and because Smith’s performance is so good, the film is more successful than it almost has any right to be. It resists the temptation to make Miss Shepherd simply either a wacky eccentric or a sad-sack only to be pitied. Because we have to work to like her, we have to work to understand what Bennett is saying in the film, ultimately grounding the film and giving it significance. “The Lady in the Van” stars Maggie Smith, Alex Jennings, Frances de la Tour and Jim Broadbent. It’s rated PG-13 for a brief unsettling image. It’s screening exclusively at Premiere Cinemas Westgate Mall 6, 7701 W. Interstate 40.